Bob Krist starts things off by showing off the Nikon gear. He shows you some of the different Nikon flashes, and shows you how you can place your gear into commander or receiver modes to work wirelessly. Bob then goes step by step through a typical studio shoot using speedlights. He starts with a simple on camera flash, and by showing exactly the shots he took from the camera, gives a great before/after effect as he brings in more flashes and a reflector. This is a great way to show how the placement, use, and direction of the lights helps shape the quality of the light. It should also help sell lights, because he used 3 of them. Bob also pulls out his hard case and shows you the light weight kit that he travels with. Pretty impressive and light weight. If your credit card is screaming “me too please”, then here is a list of all the stuff he had in his case. The best part of the video is when Bob is joined by Joe McNally. You may have read his book the Hot Shoe Diaries. Honestly, I bought the DVD because Joe was in here doing some on location lighting. I was not disappointed. He covers portrait sessions including an indoor and outdoor shoot with a bride,¬†a couple of outdoor environmental shots, and some indoor shots of some dancers. Several of the shots were done¬†with one light. They do build up to a shot¬†with a boat on a dock¬†where they¬†pull out 12 speedlights. Yikes. The great thing is that you get some insight into how the thought process goes. Joe has an idea he wants to try, and then he lets you look at the image so far as he explains what he wants to try next¬†to improve the shot. It’s good stuff.¬†It is also nice to see that shaping the light is a process. Not something that you only have one chance to set up for. You take an idea, and go from there. 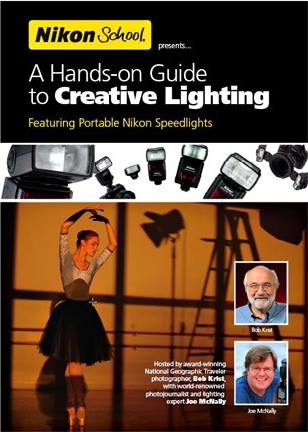 If you only have one flash and want to get an idea what you can do with it, or have several and just want some McNally inspiration, I think that you will find this an entertaining source of information, well worth the price. This entry was posted in Photography, Reviews/Thoughts and tagged CLS, dvd, flash, Joe McNally, nikon, speedlights by Chris Ward. Bookmark the permalink.